I'm not sure I've ever used a mascara that gave me so much length. It's ridiculous. Nothing can even come close. The trade-off for so much length is that it doesn't give a ton of volume. I didn't have any issues with my lashes clumping together, though. I absolutely love this mascara. For me, it gives amazing volume and length, and gives you a full-lash look. 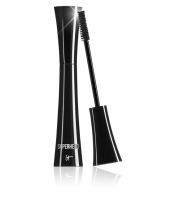 I always, always, always find myself reaching for this mascara over others, because I know it will amp my lashes up with serious drama.